Please enjoy a selection of favourite reference bookmarks related to fabric. Are you a fabric stasher? 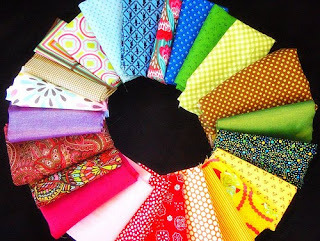 Do you like buying fabric without a clue as to what you will do with it? See how to estimate yardage when you are buying fabric, but don't yet have a pattern. These tables, provided by Denver Fabrics, give you suggested yardage for shirts, t-shirts, sweatshirts, slacks, skirts and dresses. Measurements are provided in both inches and centimetres. This collaborative website is being filled with information by fabric enthusiasts. With each fabric indexed according to content, construction and family, its an interesting read. There are gaps here and there, but the documentation is extensive. Information includes how the fabric is made, its drape, care and sewing challenges. There are also links to pictures of completed projects using each fabric. Can't tell your tell your burlap from your boucle? Not sure if its selvage or selvedge? See Fabric Link's textile dictionary. There are no pictures, but plenty of short,helpful definitions. major research mode! Useful stuff, thx. Ok. You must be the person to ask. What is 'nap' ?!! Thanks for sharing- lots of useful info there! Gina, I was going to be a smarty pants and say a nap is "something a mum would like to take"! However, I suspect you are talking about fabric. Its the "pile" of the fabric. Things like velvet and corduroy have an obvious nap. Brush them the right way and they feel nice and smooth. Generally you have to work out the direction of the nap before you begin cutting, otherwise your project could come out looking (and feeling) all funny! Thanks for that list- great resource- i never thought to look on wiki. Thanks for these fantastic links. They are perfect for the frustrated parents of textiles students (Yr 11 & 12's like to leave their assignments till Sunday night and it's always the 'technical' stuff they need help with - not the fun 'sewing' stuff).